According to Shaiva Sidhdhaantha the God is formless (arUpa) . But for the salvation of lives He took the form of Lingam - meaning symbol (Arupa Rupa). lingam can be considered both as form as well as formless symbol. This mUrti is called sadA shiva mUrti. From the Sadha Shiva mUrti, for the benefit of lives God took a lot of forms which are called mAhEshwara mUrtis. There are twenty five MAhEshwara mUrtis (Some say there are more). Some of these mUrtis are bhOga mUrtis, usually with Shakthi like RishabArUdar, or yOga mUrtis, sitting in one of the yOga postures without Shakthi in the side like dakshiNAmUrti, or vEga mUrtis, in the state of destruction like kAlAri. Usually in the temples, SadhA Shiva mUrthi (Shiva lingam ) will be in the Sanctum Sanctorum. 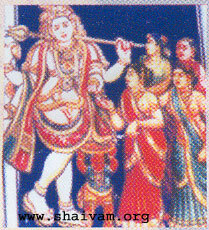 The mAhEshwara mUrhtis will be in the Praahaaram. (Outside the Sanctum Sanctorum). There are some nice Sanskrit dhyAna shlokas that praise these mUrtis. The English translation of them (with the help of Sree Hari sreehk@hotmail.com) and some information is given for that corresponding mUrti name here. The sections below deal with the various marvelous philosopically significant forms of the Formless Supreme Lord shiva.